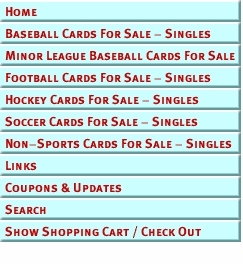 Welcome to Colleting Sports Cards Online Store for Sports and Non-Sports Trading Card Singles, Including Baseball Cards, Football Cards, Basketball Cards, Hockey Cards and More. Colleting Sports Cards is run by The Baseball Card Shop in Hermitage Pa. When You order 1 to 6 cards they will ship In a Plain White Envelope at a flat rate of $1.25, Order 7 or more cards and they ship in 1st Class Package for a Flat Rate of $3.99. At This time we only accept PayPal for payment on this site. For Team Sets, Boxes, Packs, Supplies and more Please Visit our sister site The Baseball Card Shop Online Store I'm sorry orders from the two sites can not be combined. We only ship within the US and do not ship internationally at all, no not even to Canada.